Ready to head into the week with a plan? Try these 5 steps to get you moving in the right direction. STEP #1: Survey the week. This may sound like a no brainer, but so often we set goals for the week BEFORE we even check to see if that goal is POSSIBLE with everything we have going on. Take a glance at your week and pay attention to: How busy is your day? Do you have evening plans? Lunch plans? Big meetings to prep for? All of these are going to impact your energy, your time AND your budget. We need to know these things! STEP #2: Name 1-2 Goals. I know that might not sound like enough, but the name of the game is success. USUALLY when it comes to goals, our brains are much more ambitious than the time we actually have and we create a massive to do list and feel sad pants when we are only able to cross off one thing. Instead of going ham on your goals, pick 1-2 so you can get to the end of the week with a checked off to do list! STEP #3: What is your focus? So now that you know what your week looks like and you know your goals, what will you have to focus on in order to make it happen? This could be something like meal prep or saying no, sticking to your schedule, or being flexible. This is a great exercise to give you LASER focus when the chaos starts to creep in. Instead of thinking of all of the to do’s, you can think of the one thing you need to focus on. STEP #4: How can you make it easy? Making it easy is a key component to changing behavior and sticking to what you say you will do. We humans don’t like to do things that aren’t easy to us (oh hey Amazon). Am I right? YOU HEARD ME! We think as we get older we don’t need a gold star sheet. NEWS FLASH...that is ingrained in your brain from childhood and guess what? It still works. I like to pop my goal on a post it and add boxes that I can check off. If my goal is to workout 5 times that week - I draw 5 boxes. And YES, OH YES, I get great satisfaction from filling them in. At the end of the week, reflect on a how everything went. Did it feel good? Did you try to do too much? What were your successes? When we take a hot minute for reflection, we can better understand what we need and what works best for us. We are so capable of creating new habits and behaviors, but just like other things in life, we have to first prepare. 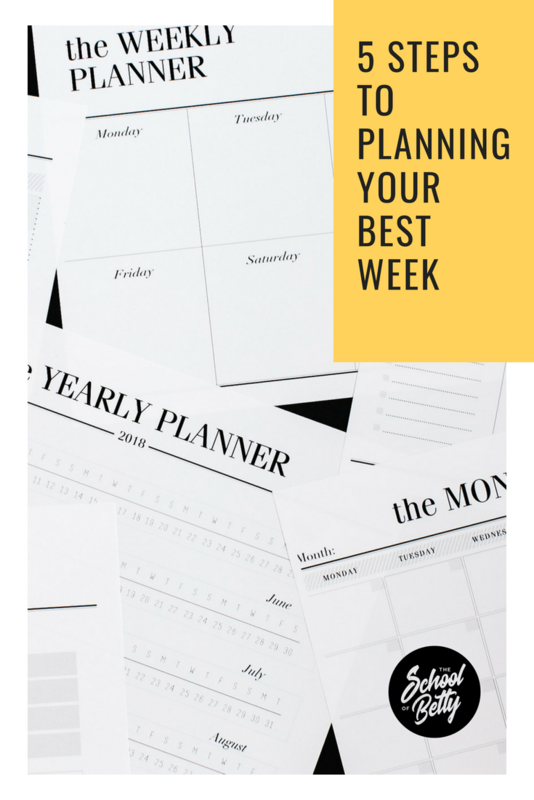 Today (and hopefully every Sunday), take some time to plan your week and set yourself up for success using these 5 easy steps. P.S. Leave a comment and tell me your goals!